My mother in law makes a killer apple crisp! When we were dating my husband often talked about his mother’s apple crisp and how much he loved it. I enjoyed the odd piece of apple crisp, but i wouldn’t call myself a “fan” of it. That is, until the day I tried a piece of my mother in law’s famous apple crisp! Let me tell you, it totally lived up to all of the hype! It was FANTASTIC! Sooooo buttery and crispy and yummy! I’ve been experimenting to create a “clean” version of apple crisp to satisfy the cravings for my mother in law’s (which is definitely NOT clean!) 🙂 Now this recipe is by no means an exact clean replica of hers, but it is delicious in it’s own right. This dessert hits the spot if you are craving a warm, cinnamon-y treat! I hope you like it! Peel and slice the bag off apples and put into a large bowl. In a blender or food processor add dates, orange juice, lemon juice, and apple sauce. Mix on on high until all blends into a very smooth consistency. Poor the contents of the blender or food processor over the apples, add the cinnamon and nutmeg and stir until all of the apples are fully coated. Pour the apple mixture into a square pan. In a separate dish, mix together the flour, oats, 1/2 cup butter and vanilla. Mix well with your hands until a crumble forms. 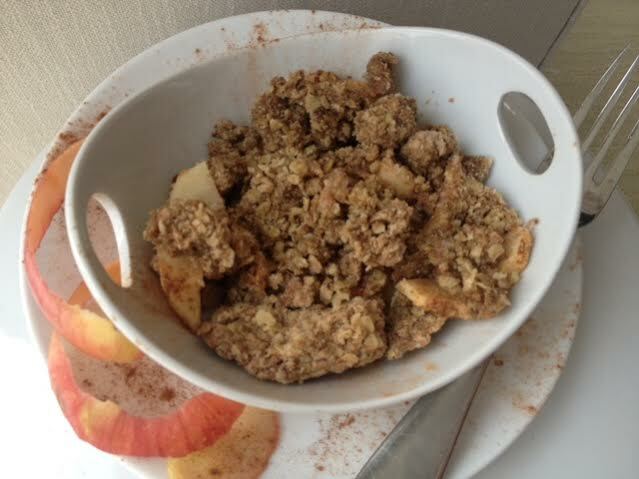 Sprinkle the crumble on top of the apple mixture. Put the dish in the oven at 400F for 45 minutes. This dish is best enjoyed warm! I hope you love it!